Netflix continues to make strong streaming cinema statements. 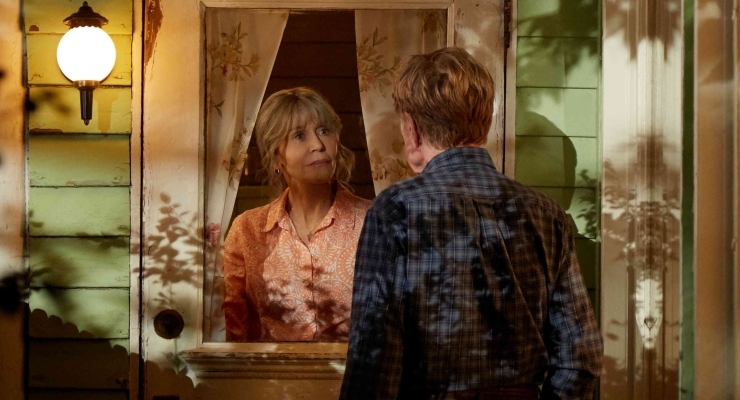 Netflix Original Film Our Souls at Night reunites Academy Award winners Jane Fonda and Robert Redford for the first time in nearly forty years. Fonda plays the widow Addie Moore and Redford is Louis Waters, a widower and retired schoolteacher, living in small-town Holt, Colorado. Judging from the dated decor of their respective houses and telephones still tethered by cords, both have been single for a long time with no compelling incentives to change their domestic environments. Although these 70-somethings have long been neighbors, they really do not know each other and have never even had a conversation. Addie approaches Louis out of the blue and asks him simply to “sleep” with her occasionally, as she believes that he is a “good man” and this will help out her nocturnal loneliness. When Louis tersely agrees, their platonic relationship finds him spending nearly every night in Addie’s bed. The couple naturally becomes better acquainted and shares personal stories that go back many years. Louis had a brief affair with a married fellow teacher that destroyed her marriage and nearly his own as well. Addie’s daughter Connie died after being hit by a car, an event that essentially tanked her marriage and soured her relationship with her son Gene (Matthias Shoenhaerts) who has turned into a bitter young man with marital problems of his own. Louis meets regularly at the local coffee house with a group of fellow seniors led by Dorlan “Beck” Becker (Bruce Dern). As word of his new relationship spreads, his friends give him figurative pats on the back for his “stamina”. Gene drops off his young son Jamie (Iain Armitage) at Addie’s house for the summer as his marriage to wife Beverly and his furniture business are both failing. Gradually, the old man and the small boy start to bond and this already endearing film tugs even more vigorously at our heartstrings. Addie and Louis predictably take their relationship to the next level during a romantic weekend in Denver. When it is clear that Gene’s wife is not coming back, Addie must make a tough choice: move in with her son (who intensely dislikes Louis for his past behavior) and care for her grandson or stay with Louis. We are left with a dangling dénouement, as life unlike art does not always tidy itself up with neat little bows. Screenwriters Michael H. Weber and Scott Neustadter have made a fairly faithful adaptation of, Our Souls at Night, the last novel by late award-winning author and Coloradan, Kent Haruf who located all of his books in the fictional town of Holt. This slow-burning autumnal love story depends almost entirely on the Fonda-Redford chemistry. Fortunately, for their many fans, they have still got it! Director Ritesh Batra simply lets these two screen icons do their thing and pretty much stays out of their way—a very smart move on his part. The addition of Iain Armitage delivers just the right amount of adorability to the cast without becoming cloying. Veteran cinematographer Stephen Goldblatt brings us into close proximity of Redford’s lined but still handsome face and Fonda’s seemingly timeless beauty. Oscar winner Elliot Goldenthal provides a heart-on-sleeve score with a welcome contribution from The Highwaymen (Willie Nelson, Waylon Jennings, Kris Kristofferson, and Johnny Cash). In the tradition of Katherine Hepburn and Spencer Tracy, Jane Fonda and Robert Redford have become one of the best twosomes in contemporary filmdom. If Our Souls at Night seems like rather modest film fare, it is still head and shoulders above much of the crud that major studios regularly throw in our faces. Netflix is to be thanked profusely for rewarding viewers with one more opportunity to see two screen legends at work. Highly recommended. 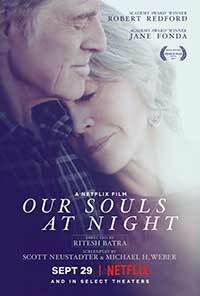 Our Souls at Night is now available for viewing on Netflix in both HD and 4K Ultra HD formats. A heart-warming little rom-com that reunites two of Hollywood's legends for the first time in nearly 40 years and demonstrates that simple story lines are often the best.